A Canadian student has been fined Canadian $400 (£230, $310) for looking at her Apple smartwatch while waiting at traffic lights. Victoria Ambrose was found guilty of breaking Ontario's distracted driving law. In court, Ms Ambrose said she looked at the watch to find out the time. This claim was rejected by the judge who said smartwatches were a distraction as much as a "cellphone taped to someone's wrist". Ms Ambrose got a traffic ticket in April after being seen by a police officer from the University of Guelph lingering at a red light at a junction on the campus. In court, the police officer said Ms Ambrose did not move off when the light turned green because her attention was fixed on the watch. She only started moving when the officer shone a side light from the police cruiser at her car. The officer then pulled Ms Ambrose over and issued the ticket, reported the National Post. Ms Ambrose did not dispute that she had consulted her watch, but said she only looked distracted because the device must be tapped twice to tell the time. 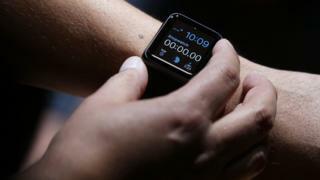 She also argued that because the watch was worn on her wrist it was subject to an exemption in the Ontario law which covers devices that are "securely mounted". The presiding Judge rejected this argument, and Ms Ambrose's testimony about how long it took her to check the time. "Checking one's timepiece is normally done in a moment, even if it had to be touched to be activated," said the Judge, adding that it was clear Ms Ambrose was distracted. The Canadian student is not the first to get a ticket for breaking the country's laws governing driver distraction by consulting a smartwatch. In 2015, a Quebec man was fined C$120 and given four points on his licence for using his Apple Watch while driving. In 2014, the UK's Department for Transport warned about the dangers of being distracted by a smartwatch while driving. It said there would be "severe penalties" for anyone who caused an accident because they were looking at their smartwatch. It said existing laws designed to deter people from checking gadgets while driving also applied to smartwatches.